ELECTRICITY RESTORED AND OUR 2 Bedroom Luxury Beach Front Condo is READY TO RENT!!! Weekly, monthly or long term rentals available!!! Where reality surpasses dreams, where the weather stays in the 80's year round, where gentle trade winds blow from the turquoise colored Caribbean Sea to fan and caress your body and soul, where you can golf, swim, snorkel and sail under clear blue skies, where you can play tennis on our two lit courts or just relax in the sun on our 500 foot sugar sand beach. We offer the free exclusive use of our two tandem kayaks. If pools are your passion, we have a glorious free-formed tile pool built around a 1700's sugar mill. Yes, life can be so sweet!! Our air-conditioned condo offers two oversized bedrooms that comfortably sleep four with 2 full baths. We now have a 32 inch flat screen Sat.TV, dvd, cd/stereo. Our kitchen is modern and fully equipped with a full-sized stove, refrigerator/freezer/icemaker, dishwasher, microwave, blender, pots, pans, etc., etc. The great room with 32' flat screen cable TV, stereo and CD player leads directly to a 30 foot long outside balcony where you sit 20 feet above the beach and gaze out upon a postcard view of white sand, swaying palms and incredible aqua-blue waters. We have high speed Wifi internet throughout our unit as well as at the pool. Our resort is located directly on Sugar Beach and is only minutes from duty free shopping in Christiansted. St. Croix offers each person their hearts desire, be it the new Divi Casino, International restaurants and nightclubs, historic forts, sugar plantations, glorious beaches and world class snorkeling and diving. Kayak with our two tandem kayaks. We truly believe you will find Unit 209 on Sugar Beach and the wonderful island of St. Croix to be a great value as well as an all-encompassing paradise! Exclusive use of our two tandem kayaks, snorkel and tennis gear. Resort facilities including beach, glorious pool and two lit tennis courts. 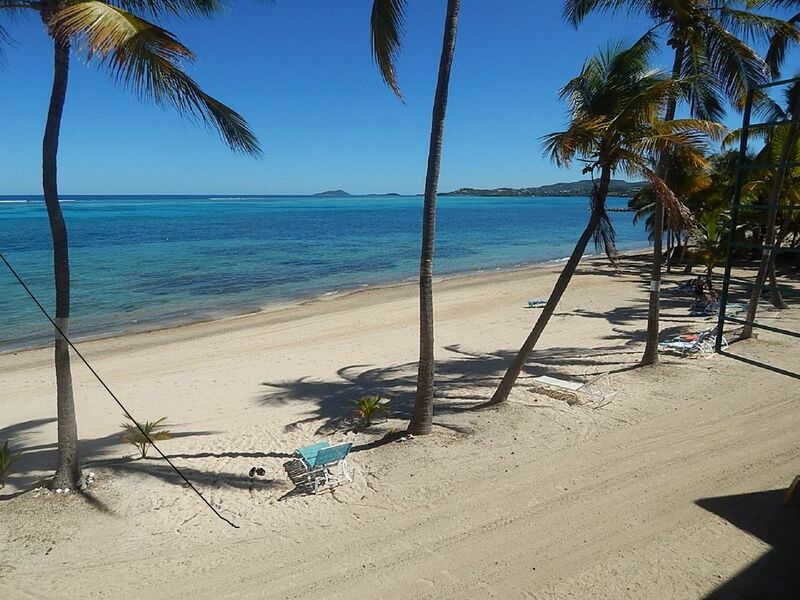 direct beach front, with 1000 ft of palm lined sugar sand beach.